The overture of felinesophy as feline and philosophy is like intertwining fate between cats and human become lost in bedazzlement. Interface between feline spheres and human world is captivating in diverse ways. Before we get into the crux, let us see the definition behind these words, feline and philosophy. Feline has two different kinds of meaning according to Merriam-Webster OnLine dictionary, relating to, or affecting cats or the cat family and resembling a cat as sleekly graceful, or sly, treacherous, stealthy. Based on history, in a nutshell philosophy means love of wisdom. Researchers have shown many studies the connection and influence between animal and human. I believe the most interesting animal would be feline. How come? My observation based on the meaning of feline as above mentioned and from the feline characters. Furthermore, many stories, tales, news, quotes, proverbs, jokes and cartoon has been involving feline. The feline has strong affect on human world, from their strategies to survive, its behavior and body language adopted into our language. What is language? Let’s see how an American man defined it. The examples of how feline inspire our language are catfight, catwalk, copycat, catnap, catfish and so on. Have you ever wonder why there are many terminologies using “cat” word? Perhaps, never across our mind why there is no such crocodilewalk, or antfight, birdnap and maybe even copyelephant? For centuries feline has given great significance and strong affect to our daily life, either they are being our companions at home, inspiration, even consider as Goddess in ancient history and our closeness to them has added their characters become more like human. Another research recently shows that feral cats or wild cats only have certain limited emotions and characters, i.e. angry and when hungry always hunting for prey. After cats being domesticated, they have several additional emotions and characters like mischievous, know how to begging for food either they hungry or just being copycat because they want to eat our meals too. They have been observing and study our responses and make use of it in interacting with us for the purpose to achieve their goals. Thus, it is the intertwining fate between cats and human become lost in bedazzlement. We like humans. They feed us, give us toys & treats, play with us, give us scritchies and entertain us. We just have to look cute! Thanks for coming by again! I will stop by again to your blogs too! Once again we marvel at your ponderings...Here in California, we have a mission called San Juan Bautista. To walk through it's chapel is to trace back in time, the connection between feline and man. When the missionaires and Native Americans built the chapel, they left the adobe tiles, that where to be used for the floor out in the sun to dry. The missionaires who kept cats to control the amount of grains lost to rodents, perhaps did not think about the nature of cats when placing the tiles out in the sun. As a result, the cats ran across the wet adobe tiles, forever leaving there footprints in cased in what would become, and still stands today, as the chapel floor. 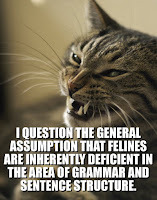 Just wanted to tell you that I've studied cats and their complicated language grammer... a mix of sounds and body language. For example... too of my cats who have gone over the bridge now. Baby would walk around Sandy and then say, "Ree." No kidding... Team effort language.